Issued to Nepalese Army on enlistment and retained throughout army career.. This kukri has always been an important component and aspect of the Nepal Army. It is issued to new recruits on enlistment and they retain it throughout their army career. It is a part of their armor, a prized possession, self-esteem and is well looked after until they retire. This knife is used on both occasions, for parade (the kukri drill) and when on duty. Senior officers regularly inspect this khukuri in order to maintain the smartness and tidiness of each soldier. 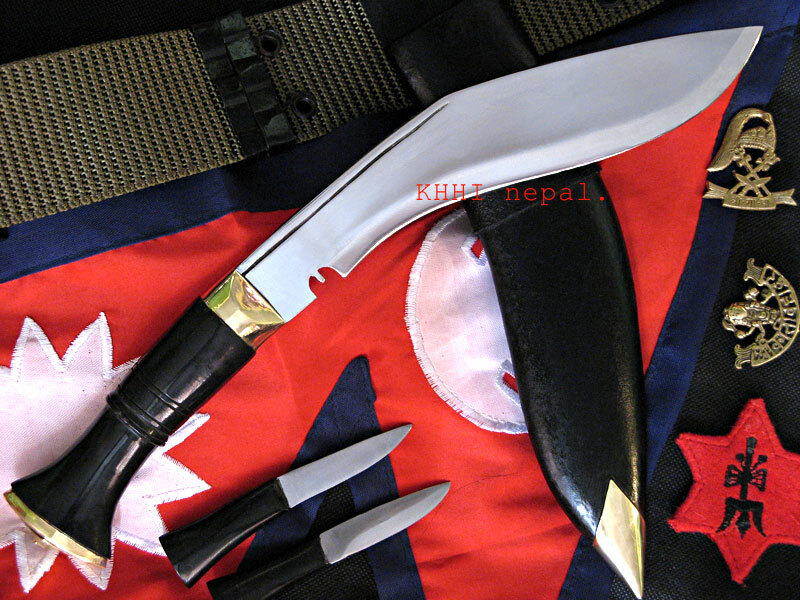 Nepal Army kukri is slightly smaller than the standard size kukri (issue) of the British Gurkhas. The smaller and lighter feature of the kukri knife makes it easier to carry around and handling more swiftly. It is the simplest of all kukris having basic fixtures. Besides its military use Nepal Army knife is also a perfect working kukri that can be used for domestic purpose or jungle warfare. 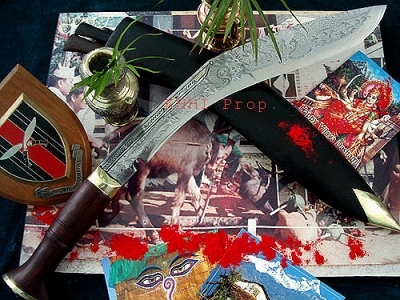 Nepal Army kukri is a continuity of the legendary official kukris from the glorious history of Nepal. The legacy of the khukuri continues but features, sizes and profiles have been significantly changed from past-present (OLD-NEW). Modern Nepal army issues kukris are much more smaller, slimmer and shorter than its old counterparts. NO marking of any sort is done in these modern kukris unlike the old ones. Nepalese Army jawans carry the kukri with pride, honor and is a spiritual source of courage and the never-give up attitude to these young lads. This original Nepalese Army khukuri is one great collection for any knife collector. It also makes an ideal gift to buy or take away from Nepal as something very authentic from Nepal. Its primary role is to defend the territorial integrity, sovereignty and independence of Nepal. Secondary role is to provide assistance to the Civilian Government of Nepal in the maintenance of Internal Security. Other duties include humanitarian assistance/disaster relief operations, assisting in national development, nature conservation efforts and participation in international peacekeeping mission. Prior to 2006 the Nepali Army was known as the “Royal Nepalese Army (RNA)” and was under the command of the King of Nepal. Yet following the “Loktantra Andolan II” (People's Movement for Democracy 2nd) on the 18th of May 2006 a bill was passed by the (unelected) Nepalese parliament curtailing royal power, this included renaming the army.Some of the senior units of Nepal Army follow: The Senior most unit is the Sri Nath Battalion, raised in 1763.The Purano Gorakha Battalion was also raised in 1763 as the First Gurkha Company and, like the Sri Nath, has an impressive record of Service, first against the British and later alongside them. The Kali Bahadur Battalion was raised in 1831, and was the first Nepalese unit to fight ‘Overseas’ in Burma in the second World War. Other units from Nepal include the Sher, the Mahindra Dal, the Shamsher Dal, the First Rifles, the Devi Dutt and the Gorakh Bahadur. 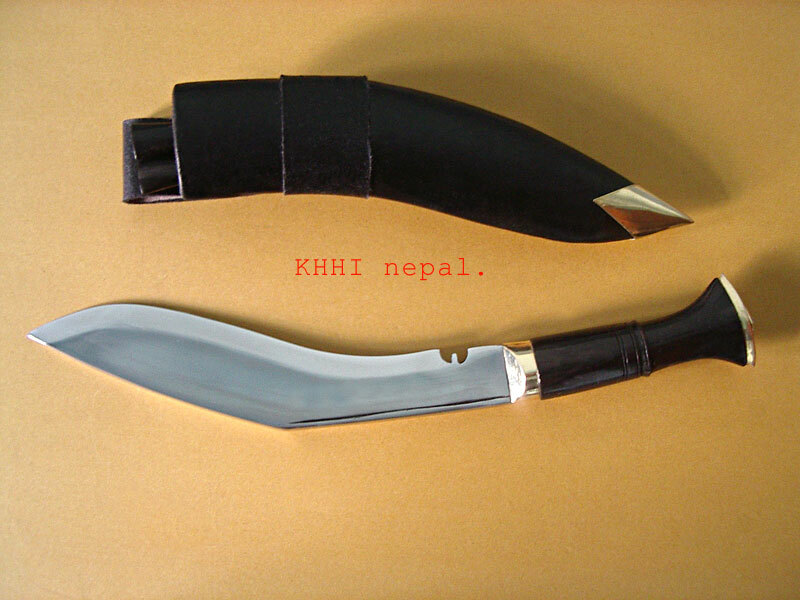 My order (1426) for Nepal Army National Issue (modified) Khukuri arrived today. Thank you. The knife is very sturdy and well-made and I’m very happy with it. I have enjoyed working with your company and please pass along my appreciation to your craftsmen for their excellent work.